The last time I wrote about my garden, I told you about the cabbage worms eating my kale and the leaf miners eating my chard. I tried to combat as best I could using homemade bug repellant that contained cayenne pepper and dish soap. They thanked me for the salad dressing. I’ve cut the chard back numerous times in hopes I’d removed them all. Nope. My kale resembles Swiss cheese, they leave just enough on the leaf to keep it alive. My garden is full of food I can’t actually eat. And herein lies the rub, I can go and buy conventional pesticides but the actual cost for product is more than what I would spend on chard and kale from the store in a summer. I don’t know how organic farmers do it. I just don’t. Now I am getting cucumbers this year. Lots and lots of cucumbers. We’ve had fresh cucumbers sliced with dinner and in salads, cucumber sandwhiches, refrigerator pickles, cucumber salad, and cucumber mint water. I actually can’t think of another use, but my family might mutiny soon. I’ve actually never had so much success. Last year I thought I had planted cucumber, but got to July and though “wow those cucumbers look zucchini”. A week later they still looked like zucchini and when I finally checked the tag in the dirt, it confirmed that I had indeed planted the wrong plant. That being said, I’m getting more cucumbers this year than I got zucchini last. My real source of frustration though is not the kale, chard, and abundance of cucumber, it’s the tomatoes. I love fresh vine ripened still warm tomatoes. Straight, sandwiches, salads and even frozen to toss in home made soup during the winter. Anytime I plant tomatoes two things happen, the first is we underestimate AGAIN just how big they grow for just how little garden we have and by July the whole thing looks rediculous. The second is that we have an insane amount of tomatoes that can’t be eaten or given away because everyone else I know has too many tomatoes as well. This year, completely competent in our long standing ability to get an excellent yield of tomatoes, we confidently planted only three plants. One cherry tomato because they are fun, one beefsteak because they are old standard, and yellow tomatoes because I want to be like all of the cool foodies with their fancy off color veggies. What could go wrong? First of all, my three wee plants grew so large that they made as big a mess as over planting ever made and literally snapped the stakes I was using to hold them up. I came home from vacation to find a tangled mess of plants and mangled stakes lying on the ground. It took about three hours, two hockey sticks, a half dozen or more new stakes, scissors, twine and my chain link fence to cut away excess foliage to reduce weight and create a rediculous looking but so far effective support system to keep them upright with the tomatoes ripening. The second thing, the most frustrating thing is that now that the plants are tidied up for the fruit to ripen, squirrels are treating it like an all you can eat buffet. Every morning and every evening I go out to check and see the tomatoes that were just starting to look ripe yesterday, lying on the ground with maybe three of four bites out it. I’ve gotten the sum total of six cherry tomatoes from my combined three plants. The squirrels have been feasting on close to a dozen yellow and beefsteak and dozens of cherry tomatoes. And they show no signs of stopping. They are also munching on the occasional cucumber but we can absorb those losses. We went to the garden centre to see what kind of barrier we could put up to keep them out. They recommended chicken wire and yet more stakes to enclose the works. I’m not paying $50 to protect tomatoes that would cost me maybe $15-20 in the store. I did pay $7.50 for bird and small animal netting figuring that I could wrap the works and worst case scenario, trap the squirrel because if he can figure out how to get in it should be too tangled to get out. 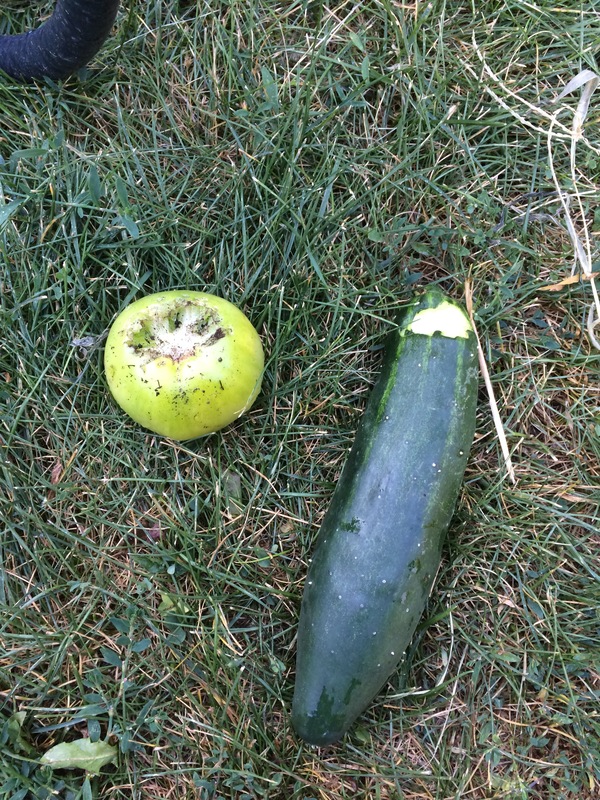 Nope, every day I find a big green tomato lying in the dirt with a bite or two out of it. The animal kingdom’s equivalent to giving me the middle finger I’m sure. At this rate, even though I gave the garden lots of attention, even though I watered faithfully and went out of my way to weed, even though there has been sunshine every day, I’ve got nothing to show for my efforts other than the gray squirrel who sits and waits for me to leave and then helps himself, likely laughing to himself the entire time. This could be the worst summer garden ever. I better not quit my day job, this girl wouldn’t survive as a homesteader.